One somewhat disquieting effect of reading War and Peace is that the more your own thoughts show up in its pages, the less original your life begins to feel. I’ve come to believe that Barth’s first two novels, more realistic and less stylistically experimental, are undervalued and under-discussed. I think they are stunning achievements. I would rather have written The Floating Opera than all of the Rabbit books (and, for that matter, I prefer Thomas Berger’s Reinhart quartet, too). As writers, we are drawn to each other because we understand the pain (and beauty) of the publishing/writing process. But jealousy is a part of most writer’s relationships. It is nice to see a friendship blossom and grow over the years despite varied careers and success levels. I hope to keep jealousy out of my relationships and build strong friendships with other writers that last as long as Updike and Barth’s. I’ve heard that Barth was an absolute terror to his students at Johns Hopkins. Some of the racial overtones in his works, particular GILES GOAT-BOY, have always bothered me. I invited both writers to Union College when I became head of the Lectures and Concerts Committee, and both agreed to meet with my students. (The edited transcripts were subsequently published in a student literary magazine and then, along with interviews with Glenway Wescott, John Dos Passos, Robert Penn Warren, and Robert Coover, in First Person. The two could not have been more opposite in personality and demeanor. Updike agreed to come for a pittance, and just before his reading, he was so anxiety-ridden that he was gasping for breath and saying, with good humor, “I don’t know why I agreed to do this.” Of course, once on stage, he was brilliant. Barth, whom I greatly admired, was offended that my introduction was so short (I chose to kept it short so that the audience would have more of Barth), and he was quite distant at a reception that followed. I don’t blame Barth for that–it was simply an expression of the man. At the time, Updike was wondering about his place in American letters and how the upswell of interest in the newly fashionable novelists, who wrote “jangly” prose and were undermining the traditional appeal of story, would affect his eventual standing.. This is a terrific and enjoyable piece about the relationship between two writers I deeply admire — thanks, Mr. McNamara, for writing it. 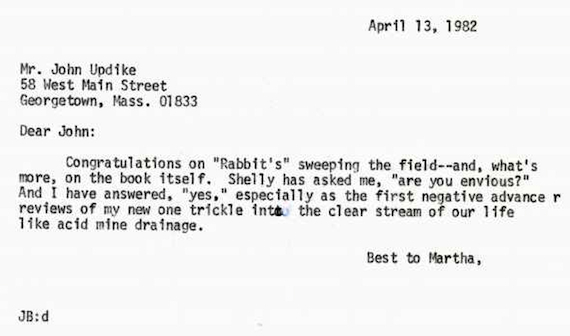 Why would Updike seem so bent on allaying some assumed fear of Barth’s that this new girlfriend would be the scandal ofJohn Hopkins? Why not just say say “My wife and I split up and I’m bringing a date”? “It’s cool, Jack. She’s not a hippie, not some loud strident radical babe who doesn’t wear a bra and spouts unladylike opinions. I haven’t lost my bearings; this isn’t some Rabbit and Jill situation. She knows her place — you know, someone from the world we grew up in, and really nothing to worry about.” She even studied under Nabokov, dude — one of us, so to speak. I don’t know whether to see this as reflection of the time, or of Updike, or of the sexist culture of academia or what, but it does seem quaint. Wow – no @Rodney Welch, that’s an awful interpretation. 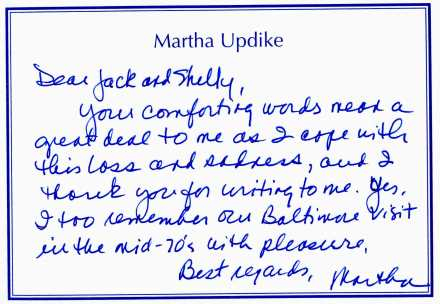 If you knew anything about Martha Updike you wouldn’t say that. Since when is anyone’s opinion just okay to say, if based on nothing but made-up notions? So basically, please have a little faith in other humans, instead of sitting on whatever throne you sit on and looking down on those who came before. What fun to read. Did the Glossolia ever get recorded as Barth recommends, in male and female voices? More writerly trivia: John Hawkes and Updike were protégés of Albert Guerard at Harvard. Hawkes shared Guerard’s belief in VOICE as a critical force in writing, and emphasized it to his students at Brown. He also ran a project called d THE VOICE PROJECT at Stanford in the 1960s. 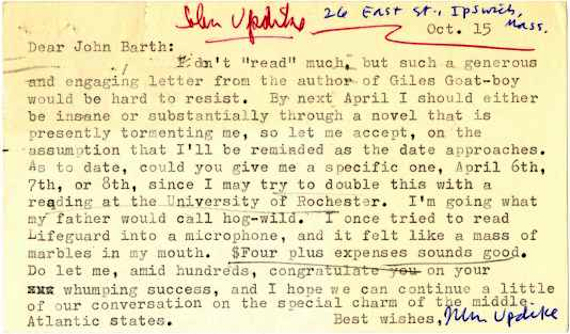 Nathan Scott McNamara, thank you for writing your essay and including the examples of actual correspondence between John Updike and John Barth. Mr. Updike came to Kansas City, Missouri, on December 8, 1998, to give an evening lecture, or, as he preferred to call them, “a reading,” to a double ballroom of listeners at the Marriott Muehlebach Hotel. I was between jobs at the time so spent the day practicing what I wanted to do that night. I arrived relatively early and positioned myself ten rows back from the podium. When it was time for questions, I raised my right arm high and held my hand straight. 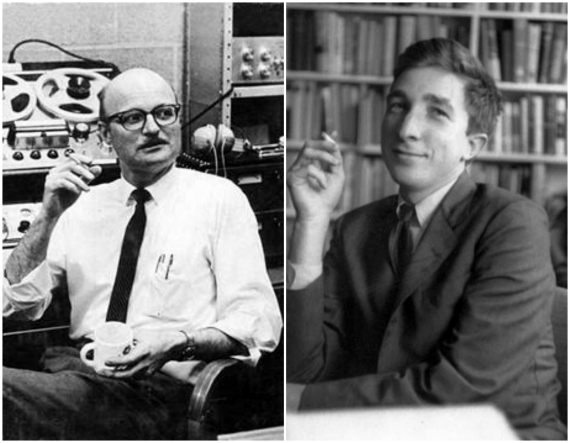 Mr. Updike appeared to be pointing to me, and I mouthed, “Me?” He nodded. I said, “You have aged gracefully since your photo was taken for the cover of Odd Jobs. You are also to be commended for your superb editing of A Century of Arts and Letters. I have found myself wondering, why do we as a society, those of us who go to hear writers, have more of a preoccupation with the process of writing than we do with sharing what we have read?” Mr. Updike replied, “Accolades aside…,” briefly mentioned “a natural curiosity…” and took the next question. I felt as if I had adequately set the stage for the late, great author’s first (and as far as I know, only) visit to Kansas City.